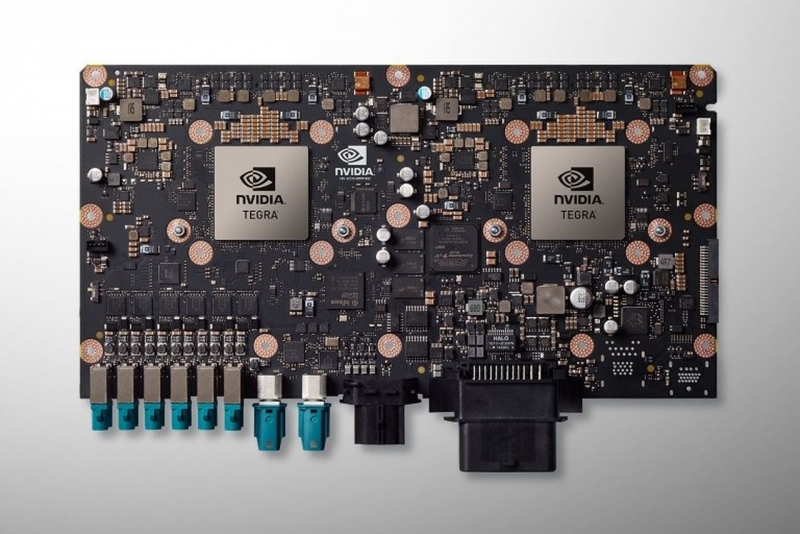 Nvidia has held its usual keynote address at CES 2016, unveiling a new processing board for cars that packs two ARM-based Tegra SoCs along with two next-generation Pascal GPUs. The Drive PX 2, as it's known, is the successor to last year's Drive PX, and is designed to facilitate autonomous driving. The idea is that you place the Drive PX 2 in the heart of the car, connect up to 12 cameras, a LIDAR, RADAR and ultrasonic sensors, and use relevant software to create the neural network of a self-driving car. Nvidia has absolutely loaded the Drive PX 2 with processing power. The two Tegra SoCs pack a total of 12 CPU cores, split between four in-house Denver units and eight ARM Cortex-A57s. On the rear of the board are two discrete GPUs using Nvidia's next-generation Pascal architecture, which, like the Tegra SoCs, are built using a 16nm FinFET process. When the Drive PX 2 is equipped with appropriate software, Nvidia claims it's good for eight TFLOPS of and 24 "deep learning tera-ops" (DL TOPS) of compute power. The board is designed to consume up to 250 watts of power, and as such, requires liquid cooling to operate. On the software side, Nvidia has debuted DriveWorks, a set of tools that can be used in conjunction with the Drive PX 2 to detect and identify objects based on the input from sensors, determine where the car is, and plot routes through traffic efficiently. The tools can also be used to accelerate the "development and testing of autonomous vehicles," according to Nvidia. The first company to use the Drive PX 2 will be Volvo, although over 50 development teams, including other car makers, have already signed on to trial the hardware. Early access to said hardware is expected to come in the middle of this year, with the general availability of hardware in Q4 2016.